The Mayor might say 7, but this writer has been waiting 9 years for this day! Something is rotten in the state of Denmark. The Copenhagen Bycyklen operator, Gobike, has 14 days to complete its contract with the cities of Copenhagen and Frederiksberg and the Danish State Railway Company, DBS, according to Danish news source, The Local. If Gobike does not fulfill its promise of 1,860 bicycles and electric charging stations by May 1, 2015 it will be forced into bankruptcy. Gobike won the contract in 2012 to bring advanced 4th generation bike-sharing to the Copenhagen region, thereby replacing the old 2nd generation service that had existed since 1995. The Gobike bicycle has computer tablets on the handlebar to transact payments, give GPS directions, and facilitate advertising. The bike is also a pedelec -- an electric-assist bicycle. About 420 of the bikes are in operation currently in Copenhagen and Frederiksberg, but the contract has not yet been satisfied as this amounts to only 23% of the full number of bikes required. Many of Gobike's problems stem from its bicycle manufacturing supplier, MIFA, which had financial problems preventing bike manufacture. The Gobike experiment is a giant step forward for bike-sharing with all of the transit interconnection and mapping features that it introduced for bike-sharing in the 21st century. Even if it stumbles, the future of bike-sharing has begun to roll in the same direction. Let's see what May brings to Copenhagen. The Bike-sharing World -The First Week of April 2015. The flowers are starting to burst into colors in the Northern Hemisphere and leaves are turning into bright colors in the Southern Hemisphere all to celebrate the World-wide Bike-sharing Fleet reaching over 1,000,000 bicycles. The Bike-sharing World Map, bikesharingmap.com, monitors the movement of automated public use bicycle systems all over the world. In its end of the year summary report for December 2014 (see here) fleet size was inching up to the one million mark. Since the beginning of 2015, 18 new cities have launched programs and many are coming out of the winter months with bigger fleets. This has pushed the total of bicycles used in automated public systems to over one million! The question now is, how to celebrate this achievement? 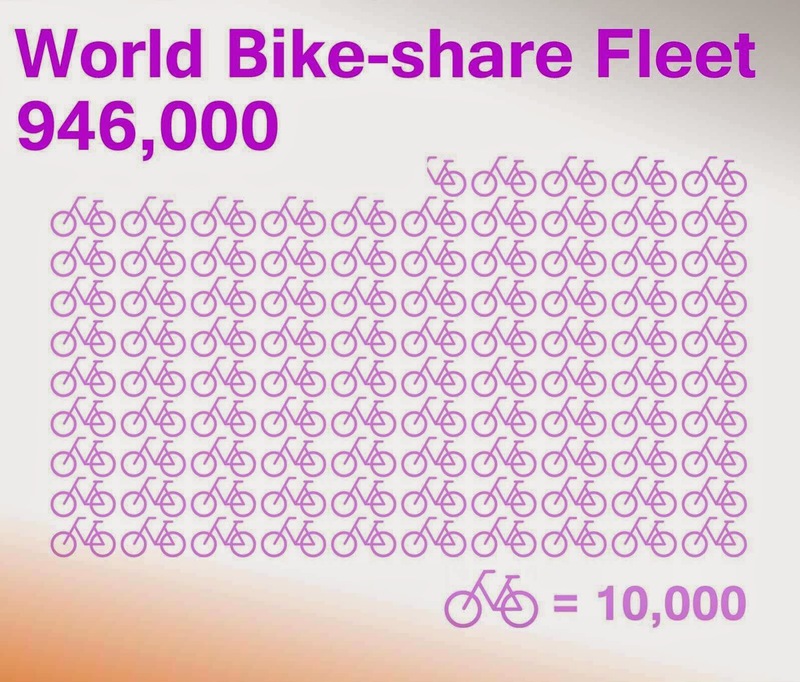 It is easy, use this momentous day to take a ride on one of these million bikes.